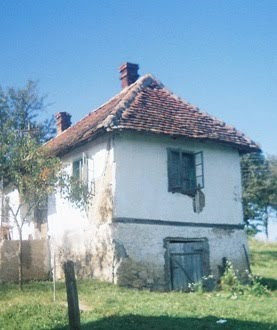 The reason I researched information about traditional rural houses (seoske kuce) in Serbia, was a personal one: my husband and I wanted to remodel his old family house in a village in the south of Serbia. But for me, only if I understand the principle of the past I can apply them in a contemporary way. And also only if I understand the regional peculiarities I can transform an old house into a modern one that blends perfectly with the surroundings. 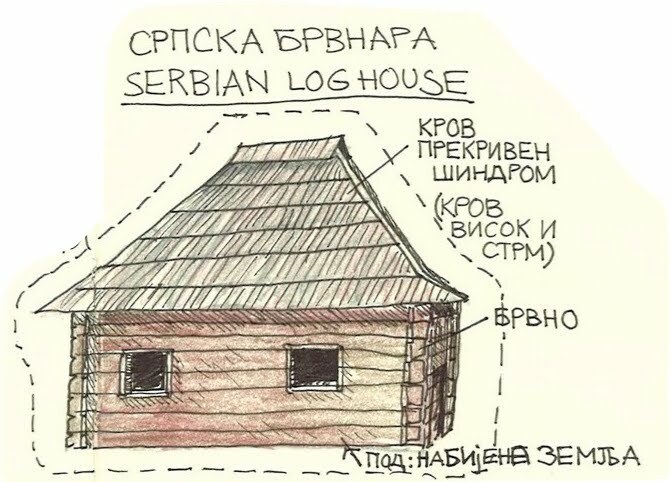 Basically the rural type houses have two typical images: there is the log-cabin (mostly in Western Serbia) called "брвнара" (brvnara, from brvno = log) and the cottage with mud-filled walls (all over Serbia) called "бондрука" (bondruka). Then there are mixed forms of these two basic types. 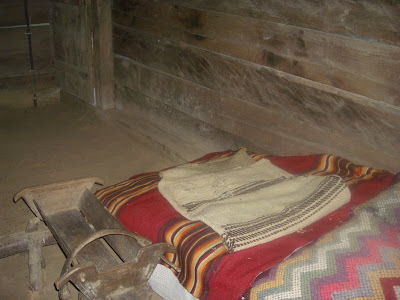 The way of construction and how the buildings and rooms were disposed, based on the experience of the farmers and how the farmers household was organized. The architecture was deducted from the form of living, and this was very close and dependable from nature, weather and the characteristics of the area. wattle of reef, wood or straw for fillings of wooden framework and wood-shingles or tiles to cover the roof. Then according to climatic conditions, the materials may vary. 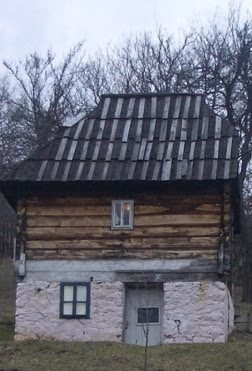 This is the oldest type and also the rarest form: the log-cabin. It's a one-room rectangle building, built directly on the ground or on a flat base of rubble stones (mostly when the terrain is steep). The tented or hip roof (four sides) is steep and covered with wooden shingles. The eaves come down very low and cover most part of the windows and protects them from weather. The typical of the log-cabin is that the walls are massive and full. The logs can be round or squared off. An open fireplace is located in the center. Usually there are two doors on oposite sides. Тhe floors are of stomped earth and the ceiling is open to the roof. Windows are just small vents in the logs, that will be closed with wood or transparent leather in winter. These log-cabins were used for living or overnight-stay in the woods, today it's still used for weekend-houses in the mountains. 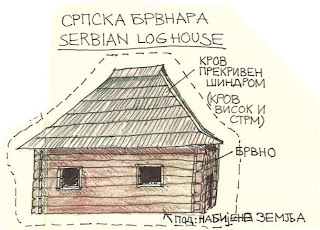 Tis is the most popular rural house in the Balkan region and is a further progress of the log-cabin. The construction is of wooden skeleton walls filled with mud and reef and plastered with mud on the outside and with plaster on the interior walls. Also here, on steep terrains the cellar is made of stones to level out the differences in height. 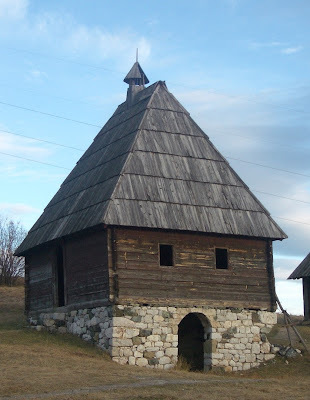 There is always a hiproof (4-sided roof) and it's covered with slightly curved roof tiles. 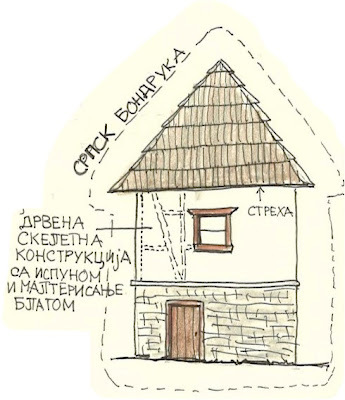 Lesson 2 in Traditional Serbian Rural Architecture will be about the most typical regional styles of village type houses. In my opinion, the amount of big stones to put together with wood it depended on how many of them there were underground, disturbing the countrymen in agriculture. The element of "wooden skeleton filled with mud" is for sure a Slavonic element, because the Romans before, Hungarians and Turks later, did use above all stones or bricks in the soul of all buildings. Brilliant, thanks for these posts! One question - do you have any knowledge of the composition of the mud that is used in the bondruka house? 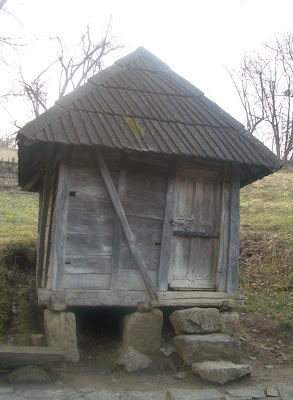 @Pillandia:a good idea to see the use of the stones like what disturbed in agriculture.on the other side stone was good to insulate the house (wood=dry) from the earth (humid). 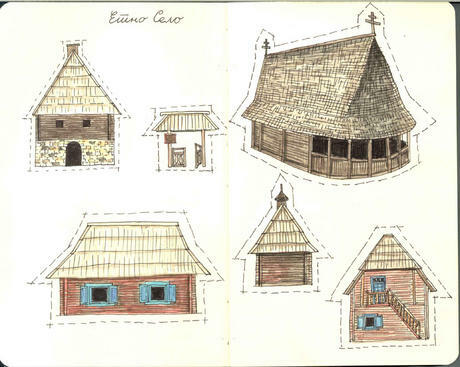 And yes, it was a popular building style all over the south-slavic region and moravian region. All the best for your project...keep me informed! 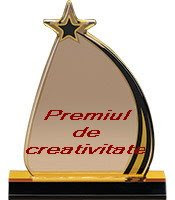 I'm going to Serbia soon, and I'm interested in Heritage as I've finished Master on it, though I'm an architect. 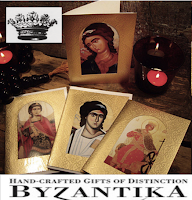 Would be really nice to contact you! please let me know if you keen! 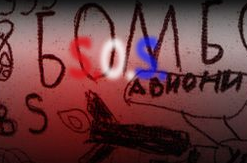 Anyway, really happy to find this blog, thank you again!